Johnson told other Tory MPs that he is “fed up to the back teeth” of hearing criticism about May. 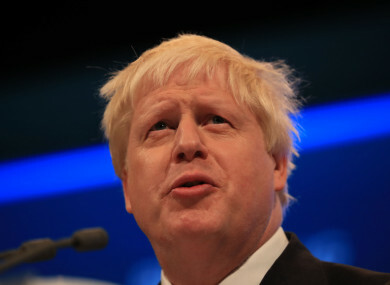 UK FOREIGN SECRETARY Boris Johnson has called on his “so-called friends and allies” to stop telling newspapers that he’s planning to move against Prime Minister Theresa May. In a Whatsapp message to a group of Conservative MPs, Johnson said that he didn’t know who kept leaking this information to the press and asked them to stop doing so on his behalf. In this morning’s Daily Telegraph, it was reported that the former London Mayor would resist any attempt by May to demote him in a cabinet reshuffle. A source, claiming to be a supporter of Johnson, said that moving him would go down “like a bucket of cold sick” with those who’d voted for Brexit. Another ally said that there was a “stench of death” from Downing Street. In a Whatapp message, seen by the Guido Fawkes website, Johnson said that he didn’t want any more information like this getting to the papers. He is reported to have said: “Folks I have just seen yet more stuff in the Telegraph and the Sun purporting to come from so-called friends and allies of mine. I am frankly fed up to the back teeth with all this. I do not know who these people are. I do not know if they are really my friends and allies or if they represent some sinister band of imposters. While Johnson has been publicly supportive of May, a 4,000 word Brexit manifesto he had published in the Telegraph a few weeks ago led to it being reported that he was planning to launch his own leadership bid against her. During her keynote speech to the Conservative Party conference last week, the Prime Minister was stopped mid-way when a prankster handed her a P45 claiming he had been sent by Boris Johnson. No sooner had she resumed, than May was overtaken by a prolonged coughing fit, which continued on and off throughout the rest of the speech. To make matters worse, the slogan on the wall behind her – “building a country that works for everyone” – began to collapse, with two letters falling off. Today, May said that the “ball was in EU’s court” as the next round of Brexit negotiations got underway. Email “Boris Johnson sends Whatsapp message telling 'friends' to stop attacking Theresa May”. Feedback on “Boris Johnson sends Whatsapp message telling 'friends' to stop attacking Theresa May”.